I found two of these computers at a Hamfest a couple of years ago and haven't been able to find out anything about them except what I have listed below. When I got home I discovered one of them had a disk in it with a copy of Whizwriter word processor and the system files on it. WHEW! Newest date found on it anywhere is February 1983. Made in Japan for Addressograph-Farrington, Inc., Randolph Industrial Park, Randolph, Mass. 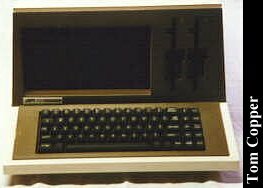 Any help to further identify this computer and how it was used will be greatly appreciated. Any software, manuals, peripherals or literature will be welcome as well. Click here to view all comments for the Addressograph-Farrington 1680 and to leave your own. Click here to view comments about other Addressograph-Farrington computers.